Halloween guests will enjoy watching the hired help when you hang this creepy jointed butler decoration up at the party. Paper cut-out decoration with hinged limbs allowing you to display it in various poses. 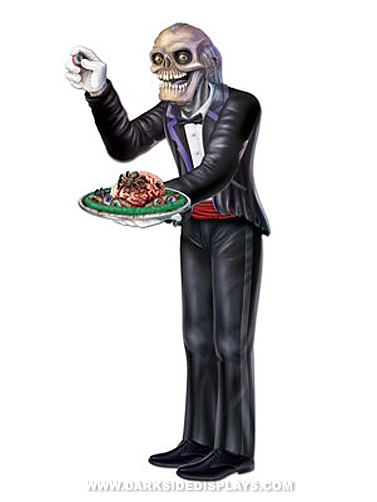 One sided print shows a creepy skeleton faced butler holding some gruesome treats. Life-sized. Jointed Skeleton Butler Decoration measures 66"H (5 ft. 6 in).